Dental implant is the latest and most successful dental prosthesis to replace missing teeth in the oral cavity which gives the best aesthetics till date compared to any replacement prosthesis prepared. But every prosthesis has its advantages and disadvantages which are the main points to be considered before deciding the type of prosthesis and treatment plan for the patient considering the local and systemic considerations of the patient. Better aesthetics: Dental implants are the best dental prosthesis available in the market if aesthetics is considered. Dental implants gives you natural tooth like appearance due to its feature of being embedded into the alveolar bone like a natural tooth which has roots for the same purpose. for aesthetic reasons Dental Implants can be used in place of Anterior Central Incisors and also for strength can be used in the posterior region of Molars because of their property of sustaining sufficient forces seen in the posteriro region of the mouth. Better Strength: Dental implants are known to have the best strength of all the dental prosthesis available at the moment. Due to this superior property Dental Implant can be used in the Anterior tooth as well as the posterior tooth. Preservation of alveolar bone: By placing Dental implant we will be preserving the alveolar bone as we insert an implant into the bone with the help of osseintegration the implant becomes part of the alveolar bone and prevents the disintegration of bone and loss of the alveolar arch height. Best support and stability and retention: Support, Stability and Retention are the 3 main mechanical aspects which decide the success of the dental prosthesis, better support helps in maintaining the implant in position to horizontal forces in the oral cavity, better Stability prevents the harmful effects of the vertical forces during chewing and better retention is due to the fact that the implant becomes a part of the alveolar bone with the help of Osseointegration. With every artificial prosthesis there are ought to be some disadvantages along with its advantages which is where the expertise of the dentist comes in. Costlier than other prosthesis: Dental implants are costlier than any other tooth replacement dental prosthesis in use. The cost is high due to many reasons and the better quality and aesthetics it provides, but the price is always a matter of thought for every patient. 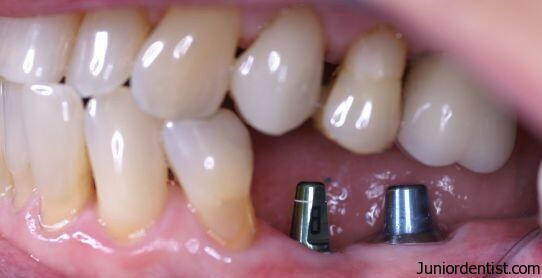 Complex clinical procedure: Dental implants placement is a complex procedure compared to either bridges or Fixed partial dentures, these are technique sensitive procedures which require proper skill in diagnosis and deciding the treatment plan. The treatment requires multiple visits. Contra indicated in medically compromised patients: Medically compromised patients with problems like Uncontrolled Diabetes, Uncontrolled Hypertension, various cardio vascular diseases, respiratory diseases etc are a strict contraindication for Dental implant prosthesis, and in the end it is upto the Dentist to decide the pro’s and Con’s related to the patient and decide whether to undergo the procedure or not. Anatomical limitations: Dental implants placement requires the presence of proper alveolar bone height to support the implant prosthesis, in old age the lack of bone support is a major hurdle in the Dental implant prosthesis procedure. Prolonged procedure time: The Procedure time for Dental implants is very prolonged, there are many steps in the procedure and after the placement of implant prosthesis in the bone we have to wait at least 15-30 days for proper osseointegration to occur which is a must for the success of Dental implant in the long run. 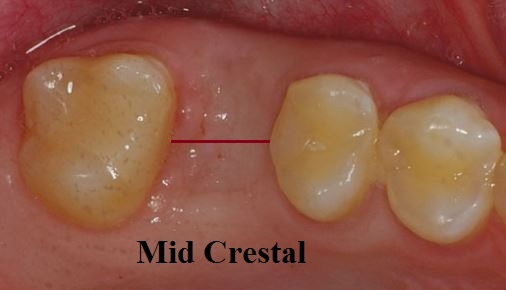 These steps make it a very prolonged procedure which is a disadvantage compared to other techniques. Costly equipment required: Equipment required is very costly by the dentist, which in turn increases the rate of the implant procedure. The use of CT Scan and specialized radiographic procedures to diagnosis and plan the treatment considerably increases the treatment cost many fold compared to the other dental prosthesis techniques. Patient compliance: In any dental treatment patient compliance plays a major role in the Prognosis of the treatment done, it hold the same for dental implants as well. With better patient compliance the success rate of the dental implant increases. The patient should attend the appointed dates regularly, maintain good oral hygiene, Smoking Cigarettes is a contraindication during implant placement. The patient has to follow these to get better prognosis. The presence of Advantages and Disadvantages in every dental procedure and their effect on the prognosis of the treatment brings in the need for experienced dentists like Dr Andrea Ubhi York and her team, who with great amount of practice and experience will be able suggest and decide the best treatment options for your specific condition. What is dental implant is explained clearly. Most of the blogs will mention the theory and the advantages itself; i really appreciate this website for providing both the advantages and the disadvantage.People will go through this if they find advantage they can really analyse their problem and have this treatment! !